Reader R Santhanam sent us this photograph. 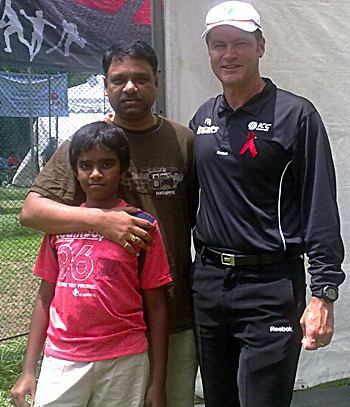 'It was a surprise to see Simon Taufel at the ICC tournament in Singapore on the 6th of September. He welcomed every visitor for a photo session during the match. 'I am in the picture with my son Dayanand and Simon. Thank-you, Santhanam, for sharing this photograph.